A fine farewell to the Trans-Antarctics! Before I begin – today I saw a bird! I think it was a juvenile Albatross. It came quite close, checking out our kites. The others didn’t see it. I saw a butterfly above 8000m on Everest, a tiny little bird in the door of my tent in a blizzard on the Greenland icecap, a snow petrel on the summit of Ulvetanna and now a huge bird at 86 degrees south, 500miles from the ocean. I take them all as good omens! Yeah! It worked! An exhausting, but exhilarating day of aggressive upwind kiting. We started in light wind on our biggest 15m2 kites. Immediately it became apparent that it was going to work and work well. 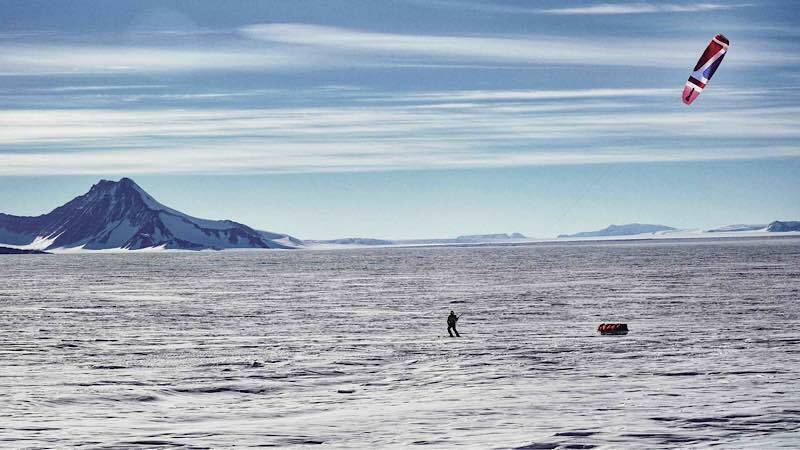 Good visibility, open terrain, a hard ice surface, GS race skis and high aspect ratio performance kites came together for a full value day of high octane Antarctic adventure. Upwind kiting is strange balance of delicacy and aggression. You can literally feel the point at which all the sophisticated equipment and skills come together and you hit the perfect angle of attack into wind. 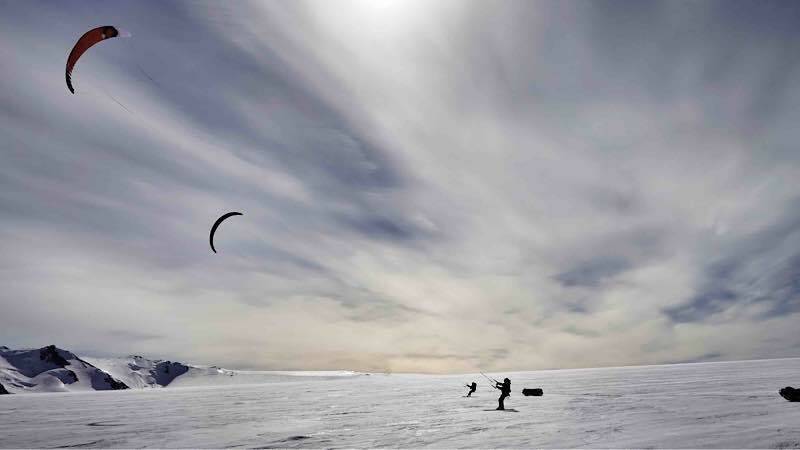 A subtle balance between your body weight, the edges of the skis, their direction and the kites power controlled by gentle but strong arm movements on the control bar. It’s a full on workout for the quads and the arms to hold a line into the wind, but exhilarating and fast. The loads were hardly noticeable apart from the gut wrenching initial jerk when changing direction on a tack. The wind strengthened and we soon became overpowered, switching directly to our smallest 9m2. For all the troubles we had with those frisky little beasts on the way in, they really came into their element today for tacking up wind, cutting smoothly across the sky. We covered 113km of ground and a point to point distance of 36 km. Almost a 3:1 ratio which is fantastic. We zigged and zagged our way all the way up the Robison glacier and significantly out of the Trans-Antarctic mountains until the wind dropped. We are now camped in glorious sunshine with not a breath of wind, 20km below the Graves Nunatuks where just a couple of weeks ago we were pinned in a storm on our entry into this most inaccessible of mountain ranges. It has been a privilege and an honour to have travelled and climbed in this desperately remote range and to have behold The Spectre. The hidden jewel of this spectacular region, buried deep and guarded fiercely, as perfect a peak as there ever could be. Our dream to see this place and climb the Spectre became reality, and it is now behind us. We are about to say goodbye to the Trans-Antarctic mountains for good, as we return to the deep freeze of the high plateau. This is the calmest it has been the whole trip. It is so silent, so peaceful, so beautiful. With a 10 knot southerly wind we can cross the California plateau in a few hours. Or it’s 3 hard days of walking. We will enjoy this splendid spot and wait for wind. There is a long journey ahead, but our time here in this other world is so limited. We must savour all the amplified experiences and emotions, as soon this will all be a memory. Though one, we will not likely soon forget! What a joy to read your blog this morning. Your deep appreciation of where you are, in a very special place, is a joy to read. Thanks for taking the time to share it with us! It will be sad not to see those beautiful mountains any more, what a skyline they have made in your photos. Crossed fingers and toes for wind. *doing the Wind Dance here! Je lis et relis vos beaux messages. quel bonheur de pouvoir suivre votre aventure. merci à la technique qui marche ! Congratulations on the successful kiting.. Wonderful narrative, articulate and succinct. I will turn out house fan here in Carefree AZ in your direction. And that looks like a f****ing blast!! Loved your blog today. 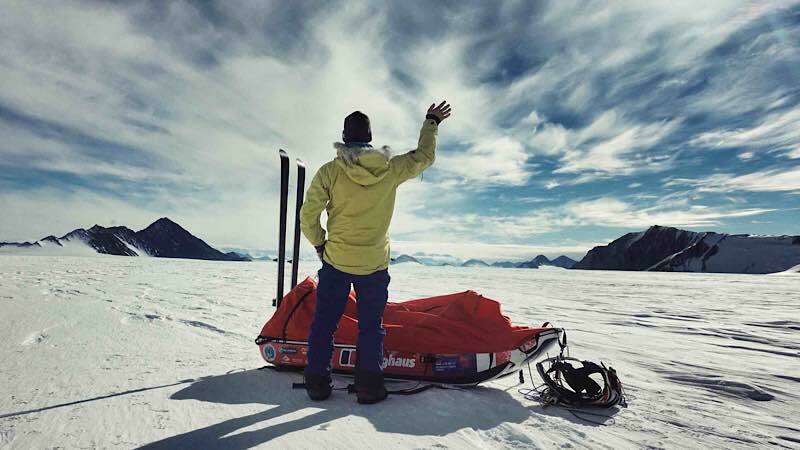 Thank you.So impressive to imagine you all tackingyour way up the glacier in your expansive white world. Sounds like you had a brill day out!!! We are up at the cottage going to have dinner with your wife and kids. Still cold here need all that gear plus some extra stuff lad. Great to here you got the kites out, Smashing it ! Reckon these lyrics are particularly pertinent at this point in the expedition…. It is a privilege to follow the expedition, to read the descriptive reports and see the stunning photos. A fabulous read, thank you. Wonderful to hear how appreciative and aware you are of all that you are experiencing. It is often said that we don’t know that this will be the last time: the last time our children desire us more than anything else or the last conversation we have with a friend who dies unexpectedly. You seem to be able to identify and appreciate that this is your last moment with these mountains and to make the most of it.